I went for a walk in the woods yesterday. The thin blue line had turned mostly white, as had the forest floor. Here are a few photos from the outing. Stuff like this beats the tar out of any store-bought Christmas tree — real or plastic. The story on the brook was very little fishable water. Somewhere below ice and froth there are brook trout. Sadly, I couldn’t find any that wanted to play. With temperatures in the teens, line and leader and fly froze the moment they hit the air. A hike through the snow pack and a Nestor Miranda Habano corona Gorda (and many layers and hand warmers) kept me nice and cozy. In my experience, sudden changes in temperature — especially a drop — are usually bad for business. So it went today. 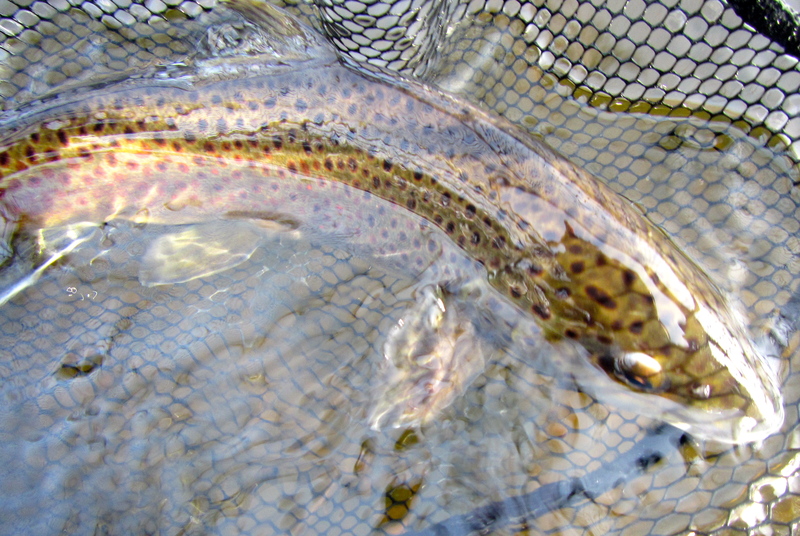 I fished three spots within the permanent TMA, nymphs and streamers, and blanked. Okay, I did have a firm tug on a streamer (solid enough to make me wonder why hook point never found mouth) but that was it. Hatches were virtually nonexistent, and ice was a problem all day. It’s not supposed to get much warmer for a while, and today was my day to get out, so I can live with the skunk. Note: as I drove past the entrance to Greenwoods/Boneyard, I noticed the dirt road is not plowed and is covered with ice. I wouldn’t plan on trying to navigate it unless you’ve got really good tires and a reliable 4WD. Good luck if you head out, and remember: the fish don’t know that it’s cold. Shaving cream — be nice and clean — shave every day and you’ll always look keen. Actually, this stuff was frozen solid. It also reminded me of baked Alaska. 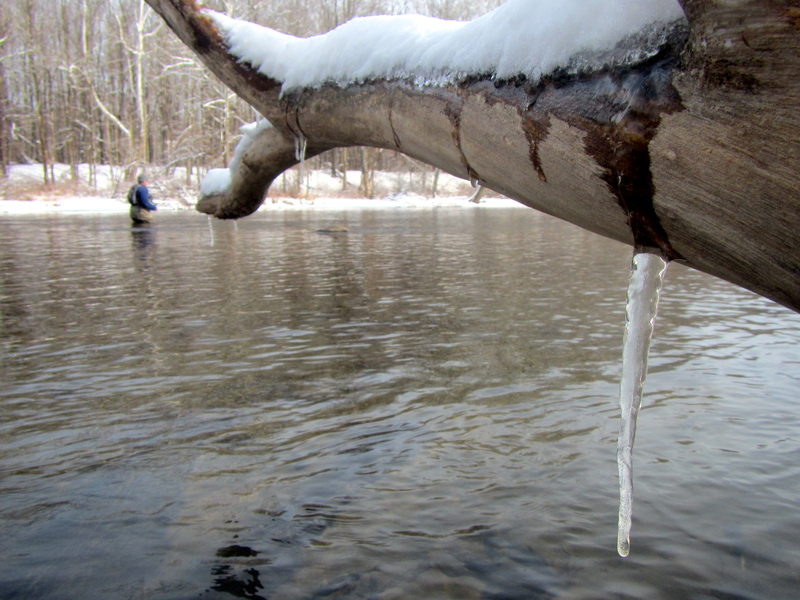 Farmington River Report 12/17 and 12/18/14: Is it winter yet? Meteorologically, not quite. And with no snow on the ground and air temps above freezing, it didn’t feel like it. Still, a misplaced hand in the water during a stumble told me right quick that this wasn’t September. Water temp was mid-thirties, flows around 540cfs, very slight stain. Thursday, 12/18/14: A mini cold front and a NW wind at 10-20 does wonders for keeping anglers off the river. Yesterday I was one of nearly a dozen. Today, all by myself. In place shortly before 11am for…nothing. Not a touch. Changed weight. Changed flies. Changed the side of the river I was fishing on. 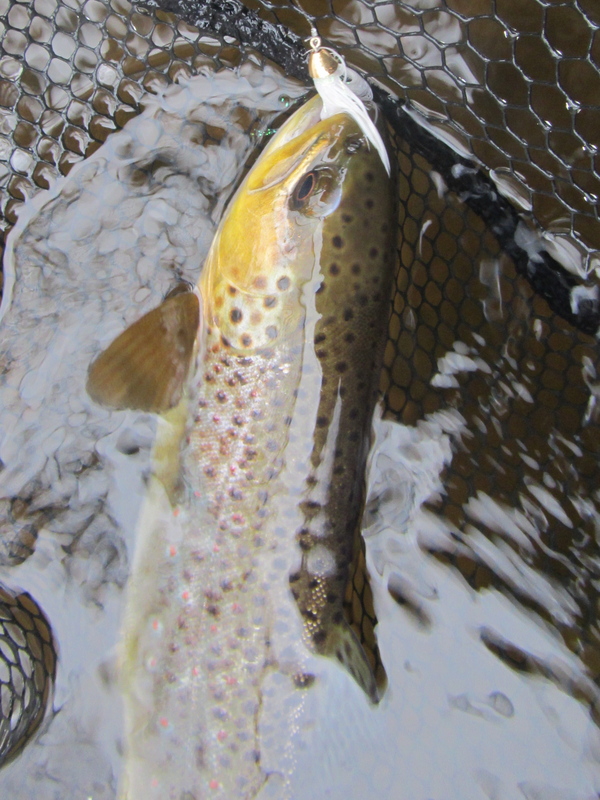 Finally, a small brown on the upward swing of the nymph. Then another momentary hookup as I was stripping my line in to re-cast. Hmmm. Maybe I should be presenting flies with some motion? 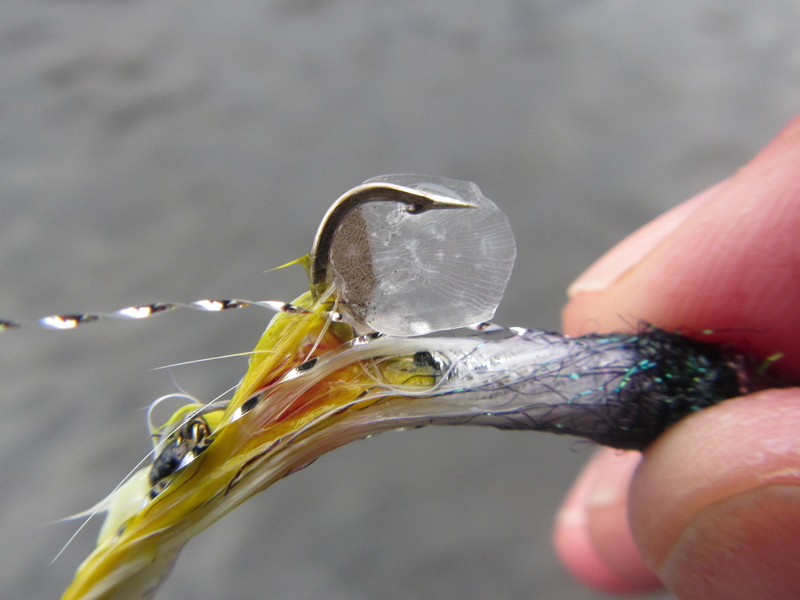 A lost nymph rig was the impetus for abandoning the small stuff in favor of streamers. And that, as they say, made all the difference. Kept at it till 3pm. Left tired, cold, and happy. There you are. First fish on the streamer today. Love the sparkles behind the eye. Looks like some kind of nebula or interstellar dust transposed from deep space to gill plate. One of several that didn’t get away. In fact, I found a whole pod of twelve-to-thirteen-inchers that were rather eager to chase. Fun while it lasted. Today’s streamer setup: Teeny integrated full sink tip (4.0 ips) with floating running line. 3-foot leader (18 inches of 15#, 18 inches of 8#). Tungsten cone head in faster, deeper water, brass in slower water. Fished single hook and articulated. Did better with the single. Today was going to be the warmest day of the week. I had to go to UpCountry to pick up my new vise. Chance of a couple hours of fishing, 100%. Of course, I wasn’t the only person who thought it would be a fine afternoon to fish the Upper TMA. Spots A and B were on lockdown, so I settled for C. And C it was on the old grade point scale, with the guy in spot A bailing trout, the guy in spot B catching a few less, and me coming in with a rock-solid average. Still, hard to complain about fishing on a weekday when the sun is out and there’s only a little ice in your guides. Especially after I lengthened my leader and added another BB shot to adjust for the depth of the water. I indicator nymphed with a size 18 (2x short) soft-hackle BHPT on point and a size 16 (2x short) BH Squirrel and Ginger as top dropper. They liked the S&G. 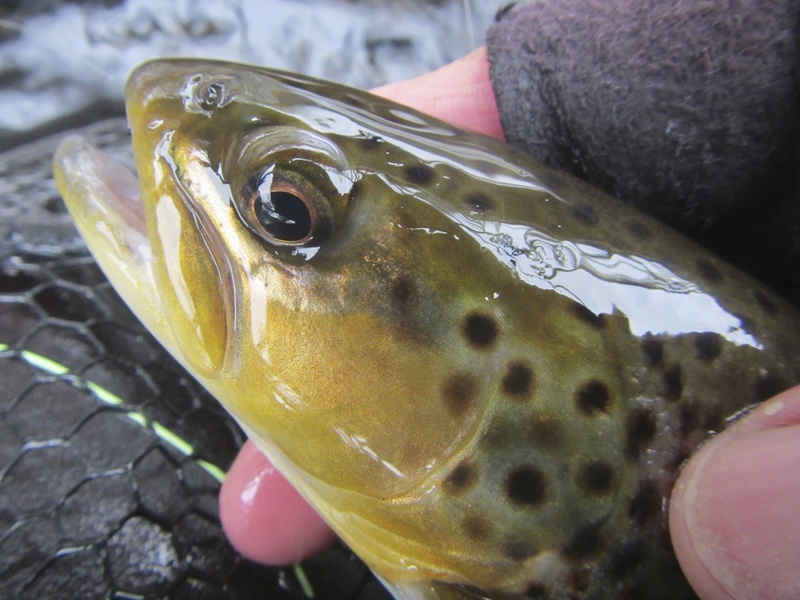 Best fish of the day was a some-teen inch Survivor Strain brown with riveting black spots and fins the size of a barn door. Didn’t see any bugs. Water temp was 35 degrees. Air temp just under freezing. Flows about 350-400. A failed attempt at an art shot. But I like the effect of the water, the sunlight, and the spotting in the upper left. This was the Survivor Strain brown. I couldn’t distinguish an elastomer, but the adipose fin was clearly clipped. After getting locked out of my first two chosen spots, I headed to a third. Crapass. This guy was fishing right where I would have been swinging streamers. So I figured I might as well get a good photo out of it.